I won’t get too much into the details of SMART targets. You are most likely already familiar with them. Smart refers to Specific, Measurable, Actionable, Realistic, and Time-bound. If you’ve seen SMART targets before, you probably saw “attainable” rather than “actionable” for the A. However, I have always felt that attainable and realistic were pretty much the same thing. I guess whoever first thought of SMART goals had to include both or else we be talking about SMAT or SMRT targets, which would be nowhere near as memorable. I therefore prefer “actionable” for an individual target, and “agreed” for team targets. But I digress. Back to me losing weight and you getting more productive. I set an overall SMART target for losing weight of losing 15 lbs in 15 weeks. That’s not overly aggressive. I could have set a more ambitious goal, but while I can indeed often lose more each week, there are other weeks where I can plateau or even gain a little. By setting a target that I can realistically meet on a consistent basis, I generally stay on track rather than feeling like I am further and further behind my target. This is vital. Challenge yourself but still be kind. Set a target that makes you focus while still being realistic, so you don’t regularly feel like you have blown it or have no willpower. You will hit your targets if you set challenging but realistic ones and then apply yourself. This was the huge breakthrough for me. Before doing this, just knowing I wanted to lose a substantial amount of weight over the next few months left me with a goal that was way out there. I therefore didn’t tell myself I was trying to lose 15 pounds in 15 weeks. In fact, I didn’t even focus on losing 2 lbs in two weeks. That would be an action rather than a result. Instead, I regularly set my mini-target weight and date, and then focused solely on my current target. My biweekly target weight always ended with a 0, 2, 5, or 7, for reasons I can explain if anyone is interested. 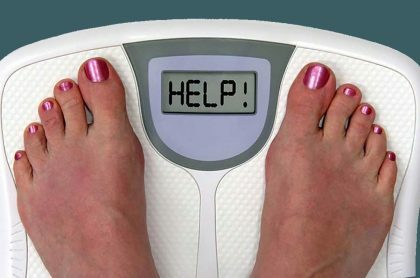 I never told myself “I need to lose 2 lbs by next Saturday.” I found it more effective to say “By Saturday of next week I will be 200 lbs.” After hitting that, I then said “By Saturday of next week I will be 197 lbs.” This allowed me to actually see my target in front of me on the weigh scale. Seeing that was much more gratifying than having a number in my head that I needed to subtract from my starting weight to see how much I had lost. I could see instantly how I was doing. It made each mini-target very tangible. So how would this work for you? Let’s say you have a goal of making 60 sales calls per month. Let’s make it easy here by assuming there are 20 work days in each month. That means your mini-target could be three sales calls per day, but even that would be vague. It would be all to easy to find 3:30 pm and then 4:00 rolling around without any calls yet being made. It would work much better to tell yourself you have to make a sales call before 10:30 am, and the second one before noon, and the third before 3:00. This would allow you to recognize early in the day, when there is still time to get back on track, if you are starting to slip. Now, to make your mini-target visual, set a reminder on your phone or calendar app to pop up a reminder 30 or 60 minutes before your target time. Note that this is ahead of rather than at your target time. Reminders on your actual deadline time would only serve to remind you that you just blew it. Set your reminders at a time that gives you a realistic opportunity to then hit your target time. Your visual mini-targets keep you on track. If your goal is to “clean the house,” you again have a very vague target. Even saying “Clean the dining room by Tuesday” is too vague. Set SMART targets of “At 7:00 pm Monday evening I will spend 15 minutes to clear out the dining room side table” and “At 7:30 pm Monday evening I will spend 20 minutes to wash the dining room floor.” Then set reminders in your calendar to pop up 15 minutes before the start of that time. Be sure to not be overly aggressive by blocking out every minute. Schedule some breaks. Leave yourself room to breathe, just as my weight-loss goals allow some room for the times I plateau or gain a little. You may even find it helpful to set a reward for yourself at the end of each mini-target, as long as those goals don’t make it more difficult to hit the next target. There is so much more that I could and will say eventually, but these steps alone will be enough to get you on track. They work for me; I have lost 9 lbs in nine weeks. That has taken some discipline, consistency, and faith in the process, but I have not starved myself to do it. Now it’s your turn. Set your end target and your visual mini-targets, and get started. You may find what was once a real discouragement and frustration can become a rewarding and even fun journey! What are your targets and mini-targets? Share your thoughts in the comments below!